Cool Homemade Ninja Turtle’s Shredder Costume Made in 3 Days! I wanted to be creative for my daughter. I brainstormed and came up with this Head on Platter costume. It was really fun to make. Everything was bought at the Dollar store except the box used as the table. My daughter stuck her head through the hole that I cut out. I painted her face and stuck a plastic knife to her head. 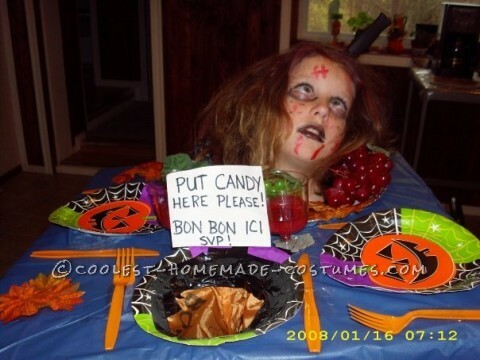 It sounds horrible, but no harm was done during the making or wearing of this costume, lol! I had got a lot of compliments on it. It is a light weight costume that is easy to carry around when you are walking to do you trick or treating. There was another hole with a bag attached underneath for the candy. We love putting this costume together.